At Allens Hill Massimo was having his last run before The Young Horse Champs next week, which he qualified for by winning at Chepstow. 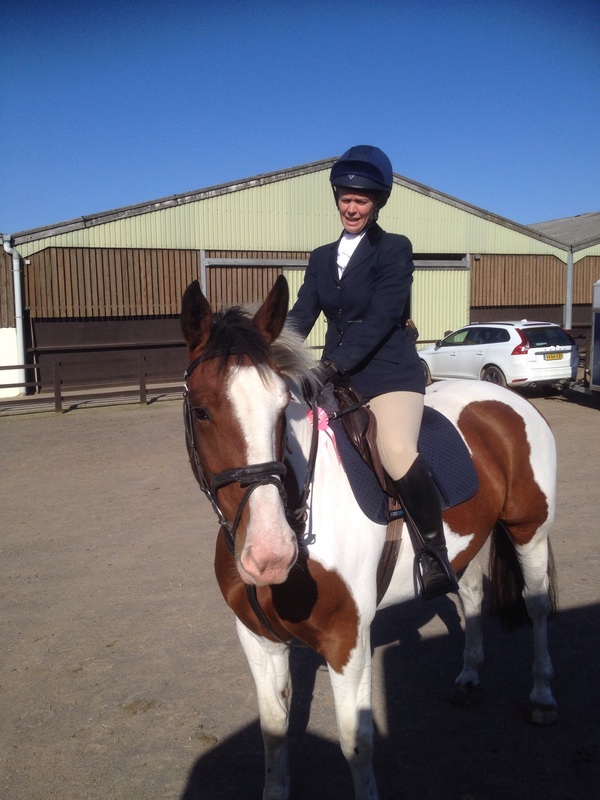 Extra dressage lessons have paid off and he once again led the dressage with a 28. He was competing in his first 1 m eventing class & the more complex dressage test didn’t phase him at all. He jumped confidently and bold as brass but he had a fair few poles down jumping, mainly it’s because he is big 17 hh and still so weak. I have made sure BS level 3 Coach Emma Slater can fit us in for a jump lesson next week. Then Saturday baby jumping at Hartpury, I took Sprout who was a bit buzzy by the more busy occasion but he jumped boldly and carefully round. Nikki took Rif Raf and they jumped a super clear in class 1 with just one rail down in the jump off, they looked so fab together. They won a lovely pink Rosette which Hugo quietly chewed on all the way home!!!! Then it was off to Moores Farm to coach a jumping clinic, I had fab riders in all the groups they rode so well and were lovely to teach. It was a great shame that for various reasons the last group ran late which meant my last rider missed her final jump round. I asked Moores Farms owners if I could have an extra 10 minutes and I would pay for the extra time, but their time constraints couldn’t allow them to do this as they needed to set the arena up for a dressage show the next day. They are a very busy show centre. I felt really bad as I never normally run late and so I gave the rider who missed out on her last jump half her money back. I am clearly far too sensitive as I then couldn’t sleep Saturday night as I felt I hadn’t been able to deliver a good enough coaching session as my one rider didn’t get as much from the lesson as she should have done. Annoying.